There weren’t too many surprises on the hardware front with the iPhone 7 release with the usual stream of supply chain leaks and rumours over the last few weeks leading up to the launch. The event pretty much reemphasized that the smartphone market, particularly the high end, has pretty much matured and Apple checked off the niggles over the entry level storage. Apple also broke a trend of sorts with the external design not changing considerably over the previous “s” year, another sign of a maturing market. There was also a lot of clarity in their positioning of the Apple Watch with the focus shifting to health and fitness, while reducing the emphasis on communication (at least for the time being). It is going to be a while before the Apple Watch is able to turn into a standalone device. The new models in tandem with WatchOS 3 do address some of the performance concerns with the first model, but we’re still some time away from an always on display. Apple also doubled down on their strengths with the focus on platform exclusives, 3D Touch and pushing the envelope on the camera capabilities. They have also increased the feature gap between the regular and Plus model this year with the camera having a tangible difference in addition to the screen and battery size, along with the increased RAM. There was of course the loss of the headphone jack that many had predicted and the switch to a non clickable home button. The former is something that many of the Android phone makers have tried to preempt, while the latter is something a majority of the non-iPhone owners are used to. As for the A10 chip, it was a validation of ARM’s big.LITTLE architecture that has been in use by the Android market for over 3 years. Big jumps in performance usually come through node shrinks, and with Moore’s law slowing Apple has its task cut out. They have pretty much set their sights on the pro camera market with the support for wider colour gamuts on the sensor and display. Plus (pun intended) there’s the dual camera lens bringing back a viable telephoto lens to the smartphone market (sort of – 56mm is closer to normal focal length). People who were hurt with Windows Phone and Nokia’s (Lumia 1020) demise have a proper alternative at last. It’ll be a while before the longer focal length on the iPhone attains the quality of the wider one, but this is just the beginning and we can expect iterations to happen pretty quick now that the ball has been set rolling by the most focussed company. Also, you don’t have to look any farther than this comparison of the original iPhone camera to the iPhone 7 to see what can be done in 10 years. Again, on the photography front, with the Plus introducing a second lens, we get closer to the “holy trinity” of prime lenses which typically refers to a wide-normal-telephoto combination of lenses to cover a majority of shooting options. Technically we’ve got the wide and normal lengths covered. Of course, the iPhone is not going to be replacing DSLRs for specialised purposes (birding, low light action) anytime soon, but you know where we’re headed. This dual lens camera also enables the journey towards computer vision thanks to the depth of field perception. What is today a sort of gimmicky feature previously tried by Android phone makers can potentially be the stepping stone towards AR. Those Intel fab rumours that have been around for the last couple of years might finally be coming true next year. The currently gimmicky, but increasingly exhibited feature of 3D Touch is most likely a stepping stone to a future where the display lets you actually feel the textures of items shown. This would take interaction to the new level and iOS 10 has finally opened up the current haptic engine to developers. Just take a look at Apple’s patents to get a feel (yes) of where things are headed. Maybe it’ll arrive as soon as next year when people expect the 10th anniversary iPhone to have an all display front. Accessibility has been one of Apple’s strengths and they also support Braille displays with their iOS devices. This expertise might just help them overall bringing out the really 3D in the touch. As to what kind of stuff is possible, check out Disney Research (guess which companies share board members?). So, where does this leave me personally? Well, I just replaced my iPhone 5s battery and it should last me another year quite easily given that the performance has all but improved with iOS 10 (I doubt anyone with a 3 year old Android phone can say the same thing). The iPhone 7 Plus camera is really tempting me to give up my DSLR entirely (I really love shooting with my Canon 50mm f/1.8 prime lens which on a cropped body like the 550D gives an 80mm equivalent focal length), it’s just the first iteration and I find the 5.5″ size too big. Apple Pay has also not launched in India either, so I’m not missing any major feature with the 5s barring the screen size and camera (I do use a Mi 4 as well, so the screen size is even less of an issue). Then there’s the next year’s iPhone of course. 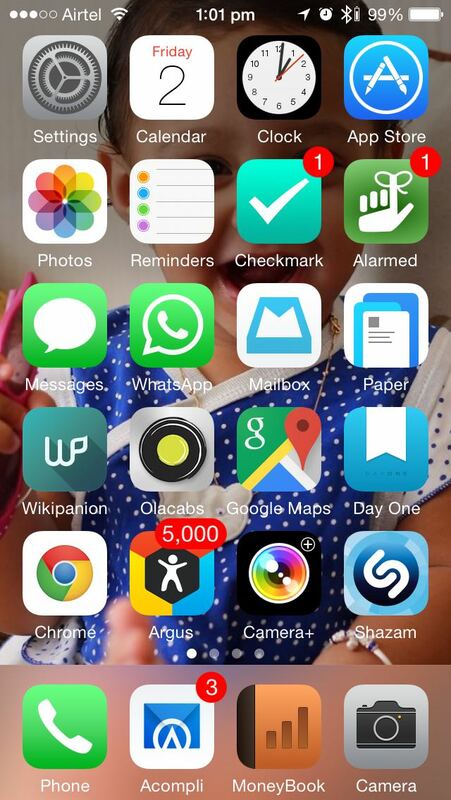 The first 6 apps remain the same as last year which are the Apple defaults. Todoist: The cross platform support including desktop apps and the convenient IFTTT channel made me pick Todoist as my preferred to do manager. This slot was occupied by the location based reminder Checkmark 2 last year, but I more or less gave up on the concept due to its relative unreliability with reminders not getting triggered in the right locations. Alarmed: It retains its spot as my preferred reminder and timer management app. I had briefly switched to 2Do but that turned out to be a bit of an overkill and not as easy to use for me. Moreover Alarmed finally got an update for iOS 8 notification actions towards the middle of the year to get on with the times. Messages & Whatsapp: The messaging apps remain the same and with more people in office getting iPhones Messages is getting a good workout. Whatsapp also got an update for iOS notification replies and other tweaks over the year to become more convenient to use. Inbox: Dropbox dropped a bomb towards the end of the year with its discontinuation of Mailbox and I promptly made the switch to Google’s own Inbox which seems to be the way forward for Gmail and has many of my regularly used features of Mailbox like swipe based actions. OneNote: This is my preferred note taking app thanks to its cross platform support and I’ve been using it even more thanks to the IFTTT integration that allows me to create stubs based on triggers from other services. E.g. I have my Office365 meetings from the calendar create stubs to record meeting notes. Google Maps, Uber & Ola: The must have travel related services for me. Google Maps continues to be an excellent source to monitor traffic conditions and the locations in India are a lot more up to date than Apple Maps. You can also download maps for offline use now, but that’s going to be difficult on a 16 GB phone like mine. I’ve also done my bit by editing a few places where I found inaccuracies. For the taxi services, Uber joins Ola as my go to services and I’ve been using these 2 services almost exclusively for the last 6 months for my day to day travels instead of the local kaali peeli taxis in Mumbai ever since the strikes started in June. Day One: I’ve managed to continue my journal habits though I’ve toned down the mundane stuff. Not much to add over last year. Safari: It replaces Chrome as my preferred browser on the iPhone due to its support for ad blockers introduced in iOS 9 (I’ve retained the copy of the discontinued Peace). Since I use a MacBook at work, the handoff and continuity features give me the cross platform browsing support I need. Streaks: I’ve been using this app to maintain some habits like hitting step targets, reading a book daily, going to bed in time, leaving office in time etc. Hours: A simple time tracking app for different projects. Had a bit of a buyer’s remorse when the app got a big price cut right after I bought it and then went free within a month. It’s a bit buggy as well. Still, a useful app to have to track my time distribution at work. Left to Spend: A simple app to track a daily budget manually. In my case I use it to track the office food court prepaid card balance. Phone: For voice calls, duh! Outlook: My preferred email client for work and the new avatar of Accompli that Microsoft acquired to create the mobile Outlook app. This retains the best of Accompli’s features like the integrated calendar view and provides better support for other services. Moneybook: I continue to track my expenses manually on this app. I tried a few other options briefly including switching to the Android based Mi 4 with its automated expense trackers, but end up returning to this every time thanks to the simple interface and the ability to perform simple arithmetic operations during entries. This would be the perfect expense tracker for me if only it had a search feature. Camera: Tried a few replacements, but stuck to this as the default. A few of the home screen apps from last year like Camera+, Shazam and Wikipanion have moved on to the second screen while I removed Paper and Argus due to the limited developments. I also deliberately moved away the social network apps to the second screen to reduce the time spent on them (not very successful yet). Overall, not a big change in the type of apps though I see a few apps moving around over the next year. Also looking forward to the new entries this year. Looks like Apple is revamping their event calendar and spacing out the events a bit more reasonable with one at the start and one towards the end. It was also a pretty busy event with ton of new launches and quite a few items that were skipped altogether – most notably the Mac OS X update. Of course the gist most of the announcements made in the event were known beforehand, but there were some surprises nonetheless. The long rumoured iPad Pro finally made its debut and pretty much validated the strategy that Microsoft had pioneered with their Surface Pro series – you need a screen larger than 10″, split screen multitasking and a keyboard to make tablets more productive. And then of course there was the Apple Pencil which was again expected given the need for precision & flexibility when drawing. The 2 biggest takeaways was first, Microsoft demoing Office in the session that pretty much sums up the vastly different approach taken in the Satya Nadella era, and second the near doubling of quoted performance of the iPad Pro over the Air 2. This definitely makes the writing clearer on the wall for Intel, as the iPad Air 2 was nearly half as fast as the Core M processors and this should bring the performance in the same ballpark. In fact, in the last few years, Apple has probably been the biggest factor behind Intel’s innovations given the dearth of competition from AMD. The fact that there was no other iPad update, unless you count the passing mention of the iPad mini 4, shows the speed at which the tablet market has matured and reached a good enough state. Arguably, the iPad 2 was at a good enough state in terms of hardware power and is still being supported with iOS 9. The iPad Pro is Apple’s attempt to grow the tablet market beyond home users and into the enterprise segment. That will definitely take a good deal of time given that most enterprises are Microsoft strongholds and the cost factor will prevent them from outright replacing PCs. Also, whatever the demos may want you to believe, most enterprise workers do not get to do such fancy stuff with their devices. Health seems to have become the main usage focus for the Apple Watch given the proportion of time given for fitness and health related aspects. This is also probably one of the scenarios where the performance of the Watch will not be constrained as a first generation hardware. The partnership with Hermes also emphasised the luxury status of the Watch, and unless the pricing changes over the years (unusual for new launches), price will remain one of the major roadblocks to its adoption. The second generation of the Watch is likely to improve the internals significantly, and we are likely to have a white iPhone moment in the future with a round Apple Watch. Then there was the Apple TV that at last gave us a glimpse of Steve Jobs famous “I finally cracked it” quote. Technology was definitely not one of the factors that had held back the Apple TV from being launched in the last couple of years, as the real battle is with the content providers rather than any of the other apps. In fact, it will probably be a while before people outside the US or some of the typical Apple strongholds will get much in form of regional content on the Apple TV. There was also no mention of HomeKit in the entire session, and this likely means that while the hardware is probably present in the new TV, the ecosystem has some way to go. The Apple TV also affirms the A8s new role as the venerable A5s long term replacement given that the iPod Touch and iPad Mini 4 upgrade to A8. Last but not the least, the iPhone 6s\6s+ updates were also along expected lines and oddly enough relegated to the end of the show. Force Touch or rather 3D Touch definitely opens up a new dimension of interaction, but the real innovation will be when we have touchscreens that are able to simulate the feel of different surfaces. The camera improvements were also pretty much mandatory given the older 8 MP sensors inability to shoot 4K videos. The unusual part of the new devices was the increase in weight of both models by almost 10% and an almost imperceptible increase in size. Then there were a bunch of touted features that have been seen before in other phones on the Android and Windows side of the fence like moving photos (HTC Zoe) and using the display as a flash (LG). Overall, the product launches rounded off a very busy year for Apple, but there was a sense of deja vu with many of the showcased features which other companies have previously demonstrated to about 80% of their potential. It is however, the last 20% of spit, polish and sweat that typically separates the Apple experiences from the rest. The first party Apple icons are self explanatory as expected. That said, I also use Dropbox, Google+ and OneDrive for my photo backups in addition to iCloud. Alarmed (a free clone of Due) is one of my favourite reminder apps due to its extensive options for setting event repeats (x days from completion being the killer feature for me). Plus it also supports creation of timers and iCloud sync (hasn’t been updated for iOS 8 though). Whatsapp is my preferred mode of exchanging online messages with my friends & family. Mailbox is mainly for managing Gmail (and no, I don’t have an Inbox invite). Paper for browsing facebook, though I still have the main app as lots of apps use it for login. Wikipanion to look up stuff on wikipedia, an app I’ve carried over from my iPad. The history feature makes it more convenient than the integrated Spotlight search or using the browser. Olacabs is pretty much the Indian take on Uber, and their recent support for the Mumbai Kaali Peeli taxis has made the app more useful than ever. Plus their mini AC cab service is a just hair costlier than the Kaali Peeli and they don’t have any premium for night time rides. Google Maps is pretty much the defacto map app for India, and I use it to check traffic before leaving office every day to choose the route to take home. Day One is my go to app for daily journal entries, and it is one of the reasons why my online posts (blog, facebook, twitter) has actually gone down. This is a paid app, but I picked it up during Apple’s app store celebration giveaway. That said, I did purchase the Mac version for my office MacBook, albeit at a discount. Chrome pips Safari to the browser slot due to its cross platform capabilities since I do use the Galaxy S3 and a Windows laptop at home where its sync functionality comes in handy. Argus is a decent fitness app, but I just use to track my daily step count against a goal of 5000 steps. I had also purchased MotionX 24/7 for this purpose and did find its idle reminder handy, but it turned out to be a bit of a drain on the battery in spite of the M7. I’ve also tried quite a few other similar apps like Move, Breeze, Human etc, and each has their strong points. With the Apple Watch coming out soon, I have a suspicion that this area is going to get an overhaul. Camera+ is my secondary camera app after Apple’s, mainly for those backlighting situations, and when I want to get the horizon level. Shazam has taken over from Soundhound for song identification due to its better record with Hindi songs. I still have Soundhound though, and its active lyrics can be pretty handy. Accompli has taken over from Mail & Cloudmagic as my office mail client that’s based on Exchange. The integrated calendar feature is quite handy, and so is the attachment section. Microsoft’s purchase of the software only increases the likelihood that it’s going to become even more handy as an Exchange client. MoneyBook is probably the oldest of the lot and one of the first apps that I purchased (for my iPod touch). It’s a pretty simple expense tracker with a nice interface and online backup capabilities. This of course leaves out the tons of games that I’ve played on my iPad, but does overlap with some apps on my Galaxy S3. A shoutout to some of my other useful apps like Zomato, OneNote, Swarm, Numerous that I use on specific occasions. I’m sure this list will look somewhat different as more apps start leveraging the iOS 8 features and then there’s of course Apple Watch. The rumour mill is really heating up, and there have been quite a few leaks showing a larger iPhone. Healthkit is also getting more features in the new betas, including built in support for step counting. What will be more interesting this time will be what Apple does with the internals, particularly the SoC and camera. On the SoC front, we’ve been stuck on the 28nm node for almost a couple of years, and they’ve already played the 64-bit card to improve performance last year. Maybe they’ll astound everyone by announcing that the new SoC (A8?) is fabricated on Intel’s facilities on their next-gen 14nm process. In fact, even using Intel’s mature 22nm process would be pretty revolutionary. There have been regular rumours of such partnerships over the last few years, so maybe this is the year of the switch? On the camera front, the decreasing thickness of the iPhones will surely limit the sensor size & optics. The 5s was probably the limit for the 8MP sensor size. This is going to be a really interesting area as Apple has thus far never traded off device aesthetics for camera specs.